As parents, it’s easy to focus on the kids and lose sight of ourselves and our needs as adults at this time of year. So, when we look at how to manage family and behavior problems during the holidays, we need to look at the effect the season has on us and on our kids. Perhaps the biggest problem we face as adults during the holidays is the increase in stress. We are often overwhelmed by the amount of work we need to get done on the job and the amount of pressure we feel due to social obligations at this time of year. Add in the stress of gift buying (especially in divorced and blended families) and we feel a tremendous emotional fatigue—which means we have fewer emotional resources with which to manage our kids. An adult who is emotionally fatigued and anxious is less able to be there for their kids emotionally. Parents have to keep in mind that their resources—both emotional and financial—are under a lot of stress at this time of year. Many emotional demands are placed upon you, and there’s very little outlet to talk about your stress as a parent because everyone’s acting so “happy.” Parents can often confuse excitement with happiness. The holidays are an exciting time. But they’re not happy times for many people. The truth is, the holidays are a lot of work–primarily done by parents. We tend to feel our economic deficits more critically at this time. When you feel like you can’t afford to get your kid the next cool, hip thing, you feel like you’re not taking care of your family. It’s important to realize that if your kid’s behavior seems more trying during these times, it’s very likely because that behavior is being magnified by your increasing emotional fatigue and decreasing emotional availability. Part of how you should manage children with behavioral issues through the holidays is to keep in mind that these children will need more emotional resources from you, not less. So, in the frenzy that is the holidays, parents need to realize what’s really important and plan and organize their lives so that they have the emotional resources available for their children. Let’s look at how the holidays affect children. It’s important to note that there is a subset of kids who actually do better over the holidays because the demands to function are not placed on them. For instance, there’s no homework to do, so Johnny acts better around the house. There are no school behavior problems to trigger frustration, so he’s more cooperative. So, unfortunately, it’s not that a miracle has occurred with your kid’s behavior over holiday break. It’s the result of having fewer behavioral triggers. But it does show you that your child has the ability to behave appropriately. You can look at it as a strength that he does indeed possess. For most other kids with behavioral issues, the higher levels of excitement or anxiety in the home at this time of year can lead to lower impulse control. Kids have less structure to contain their excitement and emotions. This creates two things. One is that you will see your child acting out more. Two is that the meltdowns you see will be more frequent and more intense. Kids need more limits, not fewer limits at this time of year. By increased limits, I don’t mean more fights between parents and children. I mean more planning by parents on the part of children. Give more thought to preparations even for simple things like shopping. Parents should work out a schedule where one of them is shopping while the other is watching the kids. While the idea of taking the kids along to shop for dad may sound fun, it may not be. If you want to take Sarah along with you to shop for her brother, think twice. Depending on the age and temperament of your child, it may not be a good idea. Decrease the stress on yourself and keep the kids at home. It’s helpful for both parents to stay at home for the very stressful parts of the day, such as after work and dinner time. So instead of one parent going home after work and the other parent going shopping, they both go home after work and then one parent goes shopping after dinner. Dinner and getting homework started are stressful times of the day, and, truthfully, the most important times of the day, regardless of the holiday. Don’t let your kids be aimless. Find ways for them to occupy themselves. Don’t forget, if kids are on vacation, they have less structure in their day. They’re going to get into more trouble and conflict because the opportunity is there for them to do it. Parents have to plan for that, and plan ways to manage that time. Plan outings for the week with your kids. Plan tournaments. If you have a couple of kids in your house, plan a holiday Monopoly or Yahtzee tournament that lasts a couple of days or even a week. Perhaps two tournaments in a week. If you have a big family, borrow a couple of board games from your neighbors. Have a tournament where kids are involved in creating the number of games, the times and the prizes. This is a good idea for any time with your kids, but especially during holiday break. Get your kids involved with baking and wrapping up cookies to take to a homeless shelter. Schedule it as a project. What items you’ll need to make the cookies. When you’ll do the shopping. Who will bake and who will pack the boxes. Then deliver them together. If you’ve never done this with your kids, try it this year. It’s really inspiring for kids. I know. I did it with my son. Communicate with your spouse—in private—about things that bother you. It’s very important for parents in intact families to communicate with each other and share frustrations privately at this time when your home becomes very public. Make an extra effort to talk together about problems at work or with the kids and resolve them privately, issue by issue, out of range of curious children and well meaning relatives who don’t know what’s happening in your home day to day. New rule: no complaining about the in-laws from December 15th to January 3rd. I always suggest this to parents. Make a pact with your spouse that neither of you will complain about your in-laws from December 15th to January 3rd. Keep a journal instead and write in it. If you can’t stand your mother-in-law, don’t complain to your spouse about it, especially in front of the kids. Write in the journal, and keep it to yourself. It’s not a good time to share these thoughts with your spouse. Use some basic math: work out your gift buying budget beforehand and stick to it. Don’t play deep pockets. You’ll end up with a spouse who resents you and kids who feel falsely entitled. If you are in a two-parent household, determine how much you’re going to spend together on the kids and stick to it. If you’re a single parent, do the same thing. If parents can’t agree on gifts, they should take turns. You buy Michael’s gifts; I’ll buy Sarah’s gifts. And then LET GO. I put that in capital letters for a reason. Many parents have a tendency never to let go. They keep buying to bring happiness to the family or to meet the kids’ demands. LET GO. Buy what you can afford and nothing more. Holiday spending tips for you and your ex-spouse. Knowing when to let go on spending is particularly important for divorced families. You have two scenarios. The first is where the parents are still very antagonistic about each other. I’ve seen endless deep pockets competition in these families that is completely ineffective. If your relationship with your ex-spouse is strained, don’t compete with her by buying too many Christmas gifts for the kids, and don’t buy more than you can afford. More advice for divorced parents with strained relationships: have a rule that says, the toys that the other parent buys stay at their home. So you play with that at daddy’s house, but not here. Keep it simple. Don’t justify it. If you are able to communicate with your ex-spouse, agree on the amount of money that you’re both going to spend on gifts. If you are going to work together for the good of your kids, you should decide together beforehand how much money you’re going spend on gifts and keep to that figure. Put a moratorium on negative talk about your ex-spouse…at the holidays and always. Call a permanent ceasefire when it comes to negative talk about the ex. If you’ve been doing it, start now at the holidays and stay with it every day. Decide you’re not going to talk about your ex in a negative light. The same goes for the kids and for your own extended family. If your kids have something to say about daddy, say, “Why don’t you talk to daddy about that when you’re at his house?” Very simple. You don’t have to justify it. You’re not the child’s confidante. All you have to do is state your position and stick to it. You will be surprised at how this cuts the day-to-day tension in your home. Blended family? Maturity first. In blended families you have the problem of having three sets of parents involved. You and your spouse. His ex and her spouse. Your ex and his spouse. It’s very complicated, and adults have to try to be especially mature about it. Let’s be clear. If the adults can’t behave maturely and responsibly, don’t be surprised if the kids don’t behave maturely and responsibly. And don’t be surprised when you have an unhappy holiday. I’ve always believed that the real satisfaction that adults get out of Christmas is by handling it well for their children. Make it a priority to communicate with your spouse’s ex about the kids without animosity. Who knows? Maybe it will become a habit and things will improve. Let the kids who live with you open their gifts first. 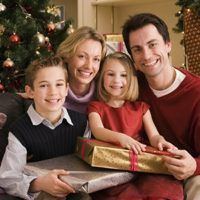 One of the biggest problems for blended families is when do you open presents? The kids who live with the family are there on Christmas morning. But other kids are coming at two o’clock in the afternoon. What do you do? In some families they open up some presents that morning and then wait till the other kids get there to open the rest. I believe that the kids who live there should open their presents that morning, and that’s your family Christmas. The important thing is not when you open the gifts between sets of kids. It’s that you keep the gifts even and don’t overspend on one kid or one set of kids. Kids may look at what you’ve bought for them and feel like things aren’t even anyway. But what they’re doing is transferring some other feeling onto the holiday. If they have a perception that things aren’t equal between sets of kids in a blended family generally, they’re going to perceive Christmas as not being equal. This perception isn’t a holiday issue. It’s something you need to deal with on an ongoing basis with that child. A successful holiday depends in large part on your commitment to planning for your kids. Planning how to use their free time constructively so they stay out of trouble and do positive things with the family. Planning how much money you’ll spend. Planning so that you have the emotional resources to give them. Planning what you’ll do with any hard feelings that develop between you and your spouse or you and your ex. We all need limits—both kids and adults. Set some limits with yourself this holiday and stick to them. The end result will be a holiday everyone enjoys.